Although the occasional large wars of New Eden dominate the news feeds, there are always a myriad of small wars going on throughout many regions of space. This article is the story of one such ongoing conflict; the invasion of the Cloud Ring region by a confederation of Gallente Militia alliances. 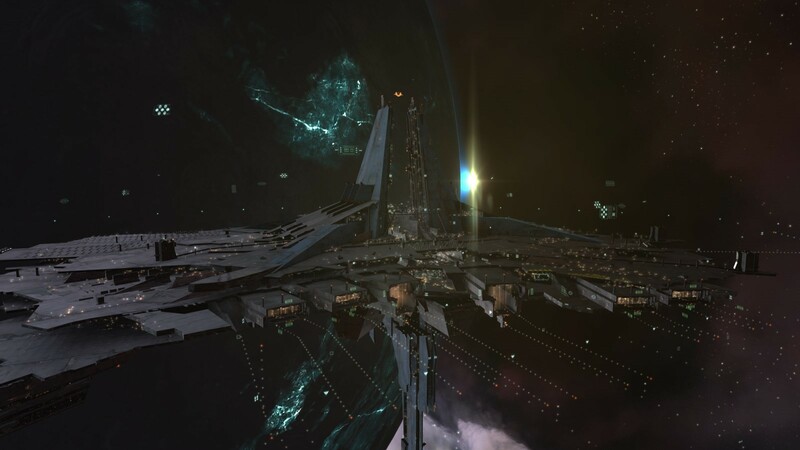 The Factional Warfare between the forces of the Gallente Federation and the Caldari State Protectorate recently ground to a stalemate. The easy availability of Upwell Consortium citadels and the spreading network of defensive alliances with pirate organizations made it extremely difficult to permanently eject any faction from a system that it controlled. This led to increasing boredom amongst Gallente militia capsuleers, long used to regular, constant fighting in their warzone. One such bored pilot was a member of Spaceship Bebop, one of the five main Gallente Militia alliances. One day, he noticed that ownership had lapsed on 6-4V20, a system two jumps into eastern Cloud Ring, within a constellation held by an alliance called Srsly Spcshipz. On a whim, he flew a transport ship to the system, anchored a TCU, and entosised it to claim the system. The alliance privately celebrated being the first Gallente corporation to claim sov space, but had little idea of what to do with it and even less idea of how sov warfare works. With a large vulnerability window centred on the worst timezone for the alliance, it was inevitable that this space was lost within 72 hours. The rest of Gallente militia and even most of Spaceship Bebop ignored this as a tiny side distraction. 6-4V20 was a terrible system anyway, very difficult for Galmil to move fleets to from any of its traditional bases. Eastern Cloud Ring had been in flux since the collapse of Psychotic Tendencies. Its ownership cascaded through a series of alliances ending with Suddenly Spaceships, who were at last ejected by Pandemic Horde after seeking to seize the most valuable moons in their constellation from the Horde. A series of small alliances from elsewhere in nullsec space moved in as the new owners, including Rebel Alliance of New Eden (RANE), Sarcos Federation (FEDS) Srsly Spcshipz (SRSLY) and The Amish Mafia (TAM). These alliances were mostly left alone to hold space and all the moons except the valuable R64s, to which Horde laid claim. The bored BEBOP member was not happy with having lost his sov. When he saw that The Amish Mafia allowed sovereignty to lapse on F7C-H0, he saw another chance and took it, claiming sov for BEBOP there. F7C was a very different system to 6-4V20. It is not only an entrance system to Cloud Ring, but it is also just 2 jumps from the Gallente Militia base in Vlillirier. BEBOP now saw a chance to take a toehold in nullsec to operate fleets from. An Astrahus was swiftly anchored to base out of, but then disaster struck. The same week that the sovereignty was claimed, BEBOP’s members realised that all the official alliance directors were on a temporary break from the game. With no way of optimising the system vulnerability timers, it was lost again to TAM within two weeks before the alliance CEO was contacted and able to appoint a new CEO and set of directors. The Astrahus still stood, however, and more BEBOP members were interested in the possibilities that nullsec offered. Small skirmish fleets were shipped to the Astrahus and a number of minor fights began against the local inhabitants and roamers. A significant problem was intelligence – BEBOP had no idea of the organization or capabilities of the eastern Cloud Ring inhabitants, with the exception of TAM with whom they had skirmished in defence of a Galmil citadel from Villore Accords in Outer Ring. An initial attempt to entosis TAM’s station in O-ZXUV identified that TAM would respond within minutes with a small gang, which swiftly jammed and then destroyed the entosising frigate. A problem at the time was that TAM’s defensive timers were in EUTZ, where BEBOP was relatively weak. The Drunk Fleet is a weekly kitchen sink (no established composition) roam run by Villore Accords where capsuleers are encouraged to start off slightly tipsy and get increasingly drunk as the fleet roams around. As the most potent Gallente fleet in late EUTZ , it was approached by BEBOP to provide cover for an entosis attempt on TAM’s O-ZXUV station. This small fight, though apparently insignificant at the time, ultimately triggered the forthcoming Gallente invasion. The fight began slowly, with one or two griffins undocking and trying to jam out the entosis ship. These were swiftly deal with, and TAM began escalating with more numbers and larger ships. However, they just dribbled into the system or undocked in small numbers and were rapidly destroyed with by the inebriated Gallente pilots, who were getting more and more amused by the free kills they were being fed. Ultimately more and more ships started arriving from the neighbouring Cloud Ring alliances leading to the Drunk Fleet being pushed off. But the Gallente pilots were cheered by their list of kills, while BEBOP leadership realised that their long experience in PVP would give a qualitative edge over the Cloud Ring inhabitants. Crucially, they also now knew that the small alliances of Cloud Ring would work together defensively – BEBOP’s first encounter with the Cloud Ring Coalition (CRC). BEBOP resolved to take and hold some sov systems in TAM’s space, confident that Gallente militia could work together to hold off the Cloud Ring coalition. The potential availability of good fights began to draw the interest of the leaders of other Gallente militia alliances. A new player now entered the drama. 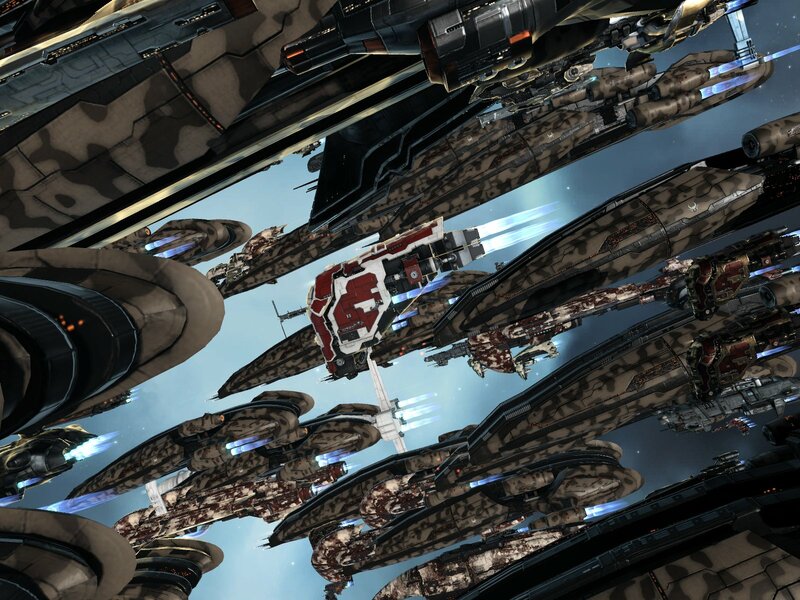 During these early operations in Cloud Ring, BEBOP fleets fought with a larger roaming fleet from a nullsec alliance called Solitaire. Solitaire reached out to BEBOP’s diplomats to offer a deal – in return for blue status with BEBOP, they would divide up TAM’s space with BEBOP. Solitaire were sent a list of 3 systems in TAM’s territory that BEBOP wanted in exchange for this blue status, offering the remaining system to Solitaire. No response came from Solitaire, but much to BEBOP’s surprise Solitaire took those 3 systems for themselves and started established a series of citadels and engineering complexes in them. Nonetheless, BEBOP went ahead and uneasily set mutual blues with Solitaire. Then came interesting news through Eve-skunk – Solitaire were mutually blue with TAM and now a part of the Cloud Ring Coalition. Despite their excuses, this made for a very uncomfortable accommodation with BEBOP. The conflict was finally triggered when BEBOP anchored a tower in TAM space which was destroyed by a fleet that included a Solitaire member. Solitaire were accused of violating their alliance with BEBOP and reset. A BEBOP fleet successfully entosised F7C and the alliance was primed to retake the system. But then something unexpected happened. In the middle of the battle for the system, a large fleet from the League of Unaligned Master Pilots (LUMPY) moved into the constellation and beat off both BEBOP and the CRC to secure the system for themselves. LUMPY promptly deployed their own citadel and moved ships into it, making it clear that they were here to stay. BEBOP’s concern about this development was allayed by the fact that LUMPY operated mostly in EUTZ while BEBOP operated in USTZ, making conflict between the two less likely. This was bad news for the CRC, however, whose EUTZ members were now raided by LUMPY and whose USTZ members would be raided by BEBOP. The growing intensity of the conflict drew the interest of the other main Gallente alliances, with Pen is Out (WANGS) and Federation Uprising (FEDUP) sending significant fleets to back up BEBOP. But Gallente militia was not the only side to receive reinforcements. A nullsec alliance called Phalanx Federation (PHALO) joined the CRC, outside power blocs weighed in on the CRC side, sending fleets to fight off Gallente raiders. The conflict escalated in other ways too, as the BEBOP capital fleet redeployed to a lowsec staging base from which it could jump into Cloud Ring and attack CRC infrastructure such as POSes and customs offices. The local residents began finding their income moon POSes replaced by BEBOP moons, which continued to feed the war machine for their new owners. Entosis fleets began striking all systems in reach, and 6-4V20 was soon retaken by BEBOP. TAM was the first alliance to leave the CRC. When the assault began, they reached out to BEBOP’s diplomat to discuss terms that would end the conflict, cede territory to BEBOP, and include BEBOP in the CRC. Their attempt was rebuffed, with TAM being informed that BEBOP was in Cloud Ring to fight, not to talk. Two days later, TAM dropped all their sov systems in Cloud Ring, handing them over to PHALO, and evacuated to a highsec system in Placid. For their cowardice, they were promptly wardecced by Guardians Of The Gate, Galmil’s hisec warfare specialist alliance, and hunted in hisec for weeks. The pressure that Galmil applied to the CRC soon began turning them on each other. In particular, Solitaire’s spies within CRC leadership led them to discover that they were being accused of failing to fight hard enough to contain Galmil’s offensive, and that a plot was being hatched in the midst of the war to seize their territory and hand it out to other CRC members. Solitaire immediately withdrew from the coalition, sold their citadels and engineering complexes to LUMPY, and moved out to Paragon Soul. Their remaining 2 systems and a station swiftly fell to BEBOP, finally providing a home within Cloud Ring for the nullsec elements of BEBOP’s capital fleet. If there was any doubt that Cloud Ring would offer better fights than lowsec, they were firmly dashed when WANGS discovered PHALO anchoring a Fortizar in prime USTZ in their newly acquired capital system, O-IVNH. Galmil formed up an 80-man fleet under WANGS leadership but were intercepted by a 175-man defence fleet . After a short intense fight Galmil successfully pushed its foes off field and made its way to the Fortizar, which was found to be under attack by a small force of Lokis from The-Culture. A brief diplomatic intervention arrange for a temporary blue status with them, and the Fortizar was successfully demolished. All three of the largest Galmil alliances were now dedicated to the full capture of eastern Cloud Ring. With BEBOP occupying half of TAM’s former space and laying claim to the rest of it, WANGS now stepped up and declared ownership of SRSLY’s systems. In a brutal 2-week long offensive that followed, neither the CRC nor their overlords in Pandemic Horde were able to hold back WANGS and their Galmil allies. 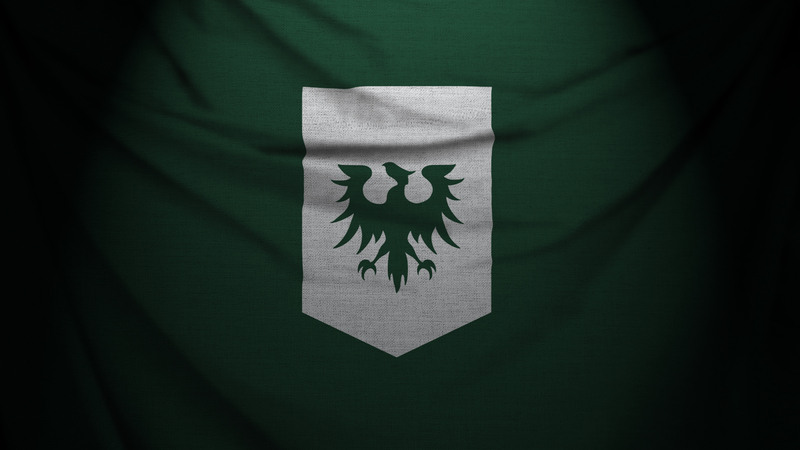 With half of the CRC’s space in Galmil hands, the label “Galmilistan” was embraced by the Gallente faction warriors for their newly established dominion. SRSLY was next to crack under pressure. The alliance began to fall apart,with key personnel and corporations defecting to join FEDS or Horde, with the remainder evacuating to lowsec space to become pirates there. Meanwhile PHALO had discovered themselves to be under a crushing economic embargo, with their money moons destroyed by Galmil, and Black Ops scouts camping their stations, asteroid belts, and system anomaly sites. Warp disruption bubbles in their HQ system prevented transport ships from moving around, while anyone trying to destroy the bubbles would find a Black Ops or capital drop on them. Eventually they concluded that holding their space, now separated from the CRC by Galmilistan, was not possible and evacuated themselves to FEDS’s space. Eventually, FEDS fell in time, first losing the systems surrounding their capital of OOTY-J and then being besieged in their capital for a grueling weeks long siege that ended with an evacuation to lowsec at the start of September. The Cloud Ring Coalition was thus destroyed , with only a single member alliance remaining holding sov in the area, rather than the coalition that held it in May. And yet, the march of Galmilistan has one last chapter left to play out. RANE continues to try to hold their space, attempting desperately to involve larger nullsec power blocs to try and stave off their inevitable defeat. And yet Galmil too has proven to be able to bring in allies, with Caldari Militia and other lowsec pirate groups including Snuffed Out and Exodus showing up to fight alongside them in critical battles. With BEBOP, WANGS, and FEDUP now holding their constellations of their own, the Gallente Manifest Destiny drives the militia to eject RANE and then declare the Galmilistan campaign to be over. Degnar Oskold has beein playing EVE since 2011, and has been in Faction Warfare for most of that time. He is currently diplomat for Spaceship Bebop.